We all know Amazon is the undisputed king of ecommerce. From November 2014 to November 2015, the company raked in more than $71 billion in online sales, which is more than Walmart, Apple, Macy’s, The Home Depot, Best Buy, Costco, Target, Gap Inc., Williams-Sonoma, Sears and Kohl’s sold.Combined. According to Fractl, a Florida-based content marketing agency which analyzed the marketing spend of these massive retailers, search gets the lion’s share of Amazon’s budget. During that year period, the ecommerce giant spent $8 million on TV and radio, a number that sounds very high in isolation. However, Amazon spent $54 million [≈ total US Soccer salaries for all teams, 2011] on print and $1.35 billion ≈ Mobile advertising spending, 2007″>[≈ box office sales of Bambi, 1942] on search. Among the other retailers, only Apple – called the most valuable brand in the world last year – and Etsy prioritize search to such a degree. Apple spent far more on TV and outdoor advertising than Amazon, though search still made up 86 percent of its spend. Search was an even higher percentage for Etsy:91 percent, with 1.39 million going to search and $90,000 [≈ cost of Porsche 911] to other digitalchannels. Etsy saw among the highest ROI in the study. For every $1 spent on marketing, the online marketplace saw $1,600 [≈ High-end bicycle] in sales. Additionally, Etsy, along with Apple and Amazon, had a disproportionately high SEMrush rankings compared with the others, which means they saw higher organic traffic. Among the only exceptions to that rule are Williams-Sonoma and The Home Depot. Digital makes up51 percent of sales – and 57 percent of the marketing budget – for the former. Nearly a quarter of that budget goes to search, but Williams-Sonoma still doesn’t rank particularly high. On the other hand, The Home Depot does, despite only spending 11 percent on search, instead prioritizing TV and radio. Macy’s is another one with a heavy print focus. The brand spends $16 million [≈ Most expensive car ever sold, Ferrari] on display and $32 million [≈ US Chamber of Commerce election spending in 2010] on search, which sounds like a lot of money, but is just a drop in the bucket by comparison. Macy’s spends 5.5 times as much on TV and more than 8 times as much on print. Nordstrom’s priority is similarly on print – $27 million [≈ Energy industry 2011 political donations] on magazines, compared with $6 million on search, $4 million on display, $5 millionon TV and $2 million on outdoor – but the strategy is a bit different from that of Macy’s. While Macy’s spends most of its money on newspapers, Nordstrom goes for magazines, a medium that meshes better with the brand’s luxury focus. Target’s marketing budget is probably the most balanced. The retailer spends 46 on TV, 22 on print and 28 percent on digital. The majority of that digital spend is allocated to search, but $23 million [≈ Typical endowment, liberal-arts university] is still set aside for online video. Today’s consumer journey is almost always kicked off with an online search. And it doesn’t end there — consumers use search to find reviews, compare prices and locate a business near them. This reliance on search gives marketers a unique opportunity to connect with consumers in a meaningful way throughout the decision process. Over the next few months, we’ll be featuring a series of interviews with search experts to explore the opportunities and challenges for brands in the ever-evolving world of search marketing. Our first interview is with Rob Griffin. Rob spent the past decade building search marketing teams and product solutions for Havas Media clients worldwide. He possesses a unique global perspective on the next wave of advancements and challenges we should expect for search in the years ahead. Rob recently brought his transformative expertise back to North America, joining Havas Media’s U.S. management team as EVP of Futures & Innovation. He spoke with T.S. Kelly and Henry Hall of The Media Strategist about his perspectives on local search and the future of SEM. While keeping close watch on the dramatic changes happening within local, data, programmatic, etc., what are some of the trends you’re witnessing in the search arena? To be clear, innovation in SEM is a vital part of my new role. Despite the many ways consumer search is evolving via local, mobile, etc., in the 10 years since I launched the first search department at Havas, the three fundamental reasons why people use search remain unchanged – discovery, immersion and navigation. What has changed is how consumers search. Google and a few others still largely own the navigation piece. Much of the discovery and immersion activity, however, has fragmented, splintering off into niche, app-based environments. Our internal numbers show it; depending on the platform or category, over 40% of search activity takes place outside the major search engines. What does search fragmentation look like from the consumer’s point of view? Let’s consider John Doe, passionate wine enthusiast, who constantly seeks out new varietals and labels. John starts the discovery process in his favorite wine app, shifting to Facebook for wines friends are discussing and then Twitter to hear from the experts. He revisits his wine app, heads over to Amazon for pricing options, and later utilizes YP for local shopping options. John may even access Expedia for travel ideas to visit the vineyard itself. All this time, John is continuously shifting focus, ‘zigzagging’ back and forth between immersion and navigation. Google or another general search engine may be somewhere in the zigzag, but typically just playing the navigational role. That’s a quite a bit of jumping around. How does all this ‘zigzagging’ consumer behavior impact the local search marketer’s planning process? ‘Zigzagging’ creates fragmentation, disjointed and frequently disconnected user experiences, an anathema to attribution and related ad tech in our space. It comes down to two critical SEM challenges, with regard to local – attribution and integrated planning tools. Attribution. In a ‘zigzag’ consumer scenario, general search engines such as Google lose some ‘connective tissue’ to specialized apps such as local search, maps, etc., living outside of search domains. When consumers go back to Google (for navigation), relevant mid-funnel search activity will be absent. It’s hard to rely on existing attribution models if they’re missing key touchpoints of the consumer zigzag. Integrated Planning Tools. Simply, we need more holistic management for all forms of search. Search marketers have lots of tools – Kenshoo, Marin, etc., are OK with Google, Facebook, etc. However, none offer clearance into search activity inside specialized app environments. Even useful location-specific services like YP — I’d love them further integrated in relation to all other SEM activity. What would it mean to marketers if the industry could better address these issues? I could offer dozens of possible applications if attribution could incorporate more apps activity and related tools could better integrate the planning and results. However, bottom line is the bottom line; my SEM teams would not only spend time and investment across more apps and more specialized tools, we would likely have a more holistic view on how to better utilize local for our brands, YP included. Stay tuned for part 2 of our interview with Rob — coming next week. According to the Digital Marketing Report Q4 2014, a quarterly digital marketing analysis produced by search marketing agency Merkle|RKG, mobile devices are now delivering 42% of the organic search traffic across the three major search engines: Google, Yahoo and Bing. The report also notes that mobile organic traffic grew 54% in the fourth quarter of 2014 from the same time period one year ago. In addition, more than half (52%) of all visits to social media sites are from mobile devices(smart phones and tablets). To anyone paying attention to consumer habits these days, this should come as no surprise. Nor should it be any surprise that you are missing out on a big chunk of traffic for your website if you don’t optimize it for mobile. Mobile users are different. Mobile users want information in quick, digestible bites so your mobile design should match how they will be using your site. For more law firms, it is essential to provide an easy way to contact you — a click-to-call button that the user needs to merely tap to initiate a phone call. You want to include essential information only on your mobile site, and keep the design simple. Good load speed is critical — 57% of mobile users will abandon your site if they have to wait three seconds for it to load, according to research by Strangeloop Networks. SEO. Search engines are now penalizing sites that are not optimized for mobile, so you could see your search rankings suffer if you don’t have a mobile site that works on iOS and Android platforms (smart phones and tablets). Lead conversion. Mobile users are much more inclined to take action than desktop users, so your calls-to-action should be highly conspicuous on your mobile site. If you are using email marketing for lead conversion, realize that 26% of all email is opened on a mobile phone and 11% is opened on a tablet. Engagement. Mobile users accessing a standard website will not engage when they have to pinch or zoom to find your content. If you provide them with a good mobile experience, they are much more likely to return to your site later on a desktop (Google reports that 90% of people move between devices to accomplish a goal). Loss to competition. Google says that 41% of mobile users will go to a competitor’s site after a bad mobile experience! 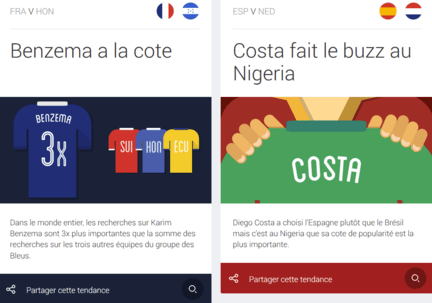 Coupe du Monde : Google joue les matchs avec les tendances. 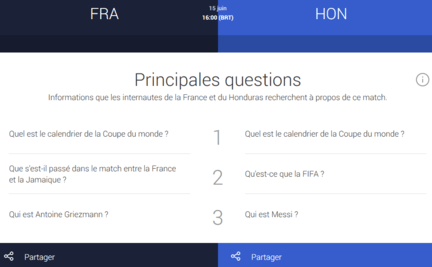 Google propose un site illustré portant sur l’analyse des tendances de recherches à l’occasion de la Coupe du Monde de foot. En prime, le sentiment dominant par pays. La Coupe du Monde de football 2014 qui vient de débuter au Brésil est l’occasion pour Google de faire jouer les matchs sur le registre des tendances de recherches. Via un site dédié qui est composé de plusieurs modules illustrés pouvant être partagés sur Facebook, Twitter et Google+, la technologie Google Trends est exploitée afin d’afficher les tendances en relation avec l’événement sportif planétaire. À découvrir, quelques insolites en page d’accueil et une confrontation des habitudes de recherches de deux pays dont les équipes nationales se rencontrent. On pourra ainsi savoir quelles informations les internautes de France et du Honduras recherchent le plus à propos de ce match, quels sont les joueurs les plus recherchés ou ceux qui suscitent un intérêt soudain. Pour le moment, avant ce premier match des Bleus, c’est la question du calendrier de la Coupe du Monde qui turlupine les internautes français ( tout comme ceux du Honduras ), tandis que les joueurs les plus recherchés côté français sont Karim Benzema, Franck Ribéry ( qui est forfait pour la compétition ) et Antoine Griezmann. Le site propose également le sentiment dominant par pays. La recette de cette évaluation repose sur l’analyse des activités Google+. Pour la rencontre France contre Honduras de dimanche prochain, c’est l’indécision côté français et l’inquiétude côté hondurien. 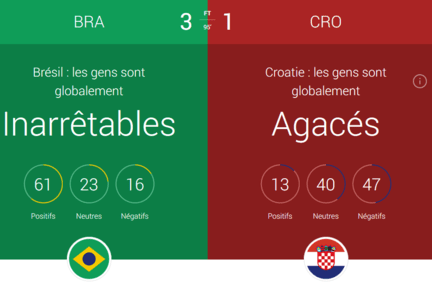 À l’issue du match d’ouverture qui a eu lieu entre le Brésil et la Coratie et s’est soldé par un score de 3 à 1 avec un arbitrage contestable, les internautes brésiliens ont le sentiment d’être inarrêtables tandis que les internautes croates sont agacés. Havas Media Brussels is hiring a Paid Search Manager who will be responsible for strategy, execution, and growth of its paid search marketing campaigns. The qualified candidate will have 3-5 years of SEMexperience, preferably in lead generation or other direct response environment. The ideal candidate must possess a keen understanding of automotive and finance business, with a strong background in pay-per-click (PPC) management. This role requires the ability to operate on both a strategic and tactical level, touching all aspects of the search marketing roadmap including keyword management, creation of campaign messaging, bidding strategies, creative testing, and analytics. This position is based at the Brussel office and reports to the Head of Performance. 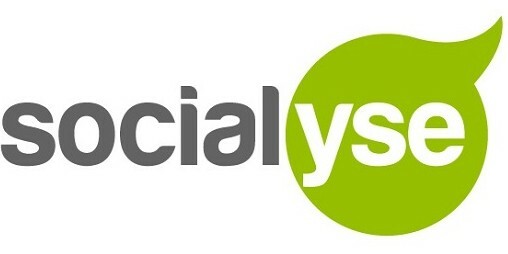 Act as a Paid Search business manager of the paid search engine marketing channel. Manage the channel by tracking, reporting, and analyzing all PPC initiatives and campaigns; responsible for forecasting and budgeting of channel. Taking the lead in the SEA team. Become a “product expert” in our industry, understand the hot issues and new developments, and create an associated keyword expansion roadmap, working with the Product Marketing team to develop relevant ads and landing page content. Develop near and long-term PPC account strategies, roadmaps and execute day-to-day tactics that increase revenue, site traffic, conversion and margins. Identify and report on key performance indicators, and opportunities for improvement on a regular basis. Day-to-day management and execution of search marketing campaigns including the campaign planning, implementation, budget management, performance review, and optimization of paid search campaigns. Drive continued innovation and best practice implementation, regularly sharing your knowledge with the Paid Search team and others. Integrate strategies and recommendations into other active marketing channels such as Display, Social, Affiliation; Email Marketing and diigital media. Should hold some combination of the following certifications: Google Adwords Certification, Google Analytics Certification, etc. Two recent changes have significantly affected Google SEO best practice – the move to 100% encrypted search resulting in the rise of ‘Not Provided’ keyword data and the launch of the new Hummingbird algorithm. This POV explores the impact of both these changes in detail and helps marketers understand how to adapt their SEO approach accordingly.